We know it's fall but we're still seeing some wonderful late summer fruits in our farmer's markets! 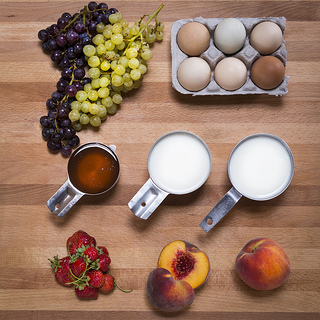 The chefs at Bon Appétit have created a simple recipe for an all-local custard with fruit topping, as well as 5 tips to be an eat local champ. Look for oils made from local nuts and seeds, or cook with locally produced butter. You can also use buttermilk in place of oil in salad dressings. The United States produces plenty of sugar from sugar cane and sugar beets, but figuring out where exactly your sweetener came from can be its own challenge. (Chances are it’s from a large, not-so-sustainable operation.) Try local maple syrup or honey instead! Even artisanal sweet makers must rely on cacao beans grown far away. Get creative with dried (or fresh) local fruit for dessert instead. Crying for pie, but can’t find locally grown and milled grains? Consider a crust made from finely ground nuts and local butter instead. For pepper, substitute chile flakes made from dried local hot peppers. Use fresh local herbs instead of dried. And try making your own ketchup with local tomatoes! All ingredients should be readily available at your local farmers market in late September. Check LocalHarvest.org to find a farmers market (or a specific provider) near you! Slice the stone fruit into 1/4-inch slices. If using strawberries, trim off the top and hull them. Cut into 1/4-inch slices. In a bowl, combine the fruit with the grape juice and honey. Let mixture sit for 30 minutes to several hours. Note: Nearly all states and regions in the United States now grow wine grapes and make locally produced wine. You may substitute 1 cup of local wine — red, white or blush — for the grape juice. Warm it in a saucepan with the honey. Simmer slowly for 3 minutes, then let cool and combine with the fruit. Preheat the oven to 300 F. In a saucepan, warm the milk until just hot; do not boil or simmer. If using a local herb or zest, let it steep in the milk while warming and remove with a strainer before combining milk with eggs. In a stainless steel bowl, combine the egg yolks and honey, slowly stirring in the honey until it is well incorporated into the egg yolks. Do not whisk. Slowly add the warmed milk into the egg yolk–honey mixture, stirring to mix together. Strain the mixture through a fine strainer. Divide the custard mix between four shallow custard dishes or ceramic ramekins (about 6 ounces each). Cover dishes loosely with foil, then place in a water bath: a large (11x14 inches or so) roasting pan or ceramic baking dish filled with water that comes up the sides of the custard dishes to about 1/2 inch form the top. Bake for 45 to 90 minutes until mostly set, still jiggly toward the center. The baking time will depend on the size and depth of your water bath. Gently shake one to test for doneness. Assemble fruit relish while custards are baking. Remove custards from oven when done. Let custard ramekins cool before transferring to refrigerator. 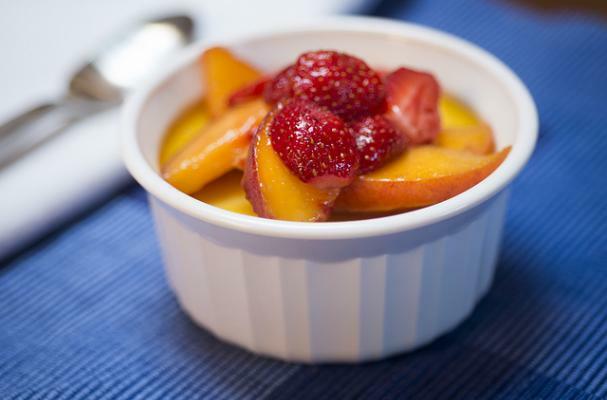 Serve with a simple seasonal fruit relish.